Phil Lichtenhan artist, Phil Lichtenhan sculptor, Phil Lichtenhan sculptures, Phil Lichtenhan found art sculptures, Phil Lichtenhan bird nest sculptures. An accomplished artist of wide-ranging talents, Phil Lichtenhan constructs found metal bird nests using as much variety in his found objects as birds do in their own search and select process – although Phil Lichtenhan selects items such as ancient fencing, barbed wire and metal mesh to create his elegant, earthy pieces that can be hung on a wall or displayed on a table. 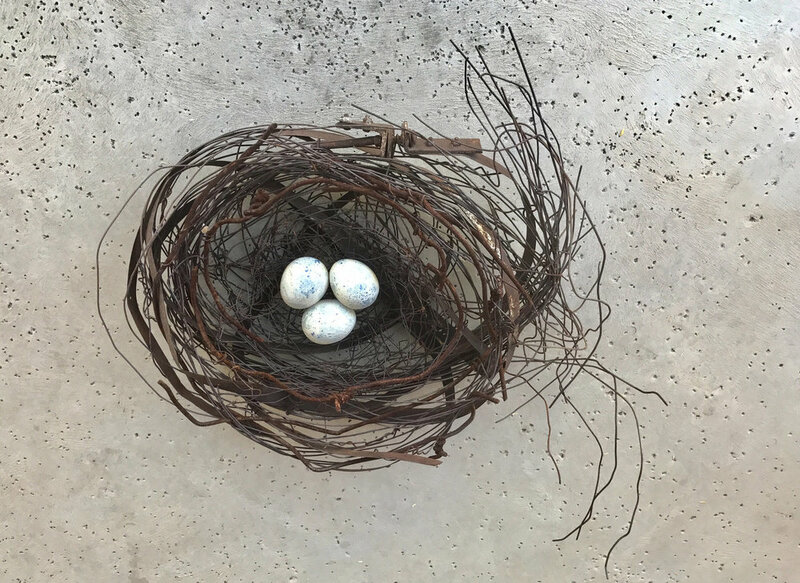 “I find my nest materials everywhere,” the artist notes: “Along the roadsides, railroads, and alleyways, in the city or out in the desert are the discards of our world.” Each metal’s natural aged patina stands in striking contrast to the delicate high-fired ceramic eggs firmly affixed in every nest. The early talents of Phil Lichtenhan led him to attend Northern Arizona University where he immersed himself in art study on his way to an extended degree in art education. He studied printmaking at the University of Arizona, exploring intaglio viscosity relief collagraphs, a highly technical process that Phil Lichtenhan pushed to newly expressive levels; an MFA in printmaking from U of A followed. Phil Lichtenhan spent decades sharing his skills through teaching, first at a high school, then a boarding school, before years at another high school. He loved the teaching process and his experiences allowed him to dabble in acting and stage design; he directed the Avery Art Gallery while at the private Verde Valley School, bringing in shows from across the nation, and he led field trips to the Hopi, Navajo, and Zuni people, developing valuable relationships along the way. All the while Phil Lichtenhan continued to make art and perfect his artistry. Since roughly 1990 he has been painting landscapes en plein air or from sketches and photographs taken on frequent hikes; he has studied the figure, producing not only literal interpretations but also expressive abstractions. In addition to his bird nests, Phil Lichtenhan produces dimensional drawings from found materials. His nests, from small to large or tall, from uniform to motley in shape, capture in their skillful construction and compelling compositions every aspect of this gifted artist’s rich artistic past. The art of Phil Lichtenhan can be found throughout the United States in both public and private collections including the University of Arizona Museum of Art, Arizona State University Museum of Art, Tucson Museum of Art, Tucson Botanical Gardens, Shemer Art Center, Bradley University Museum of Art, Norwest Bank, Arizona Commerce Bank, and the Ansel Adams estate.